In her article, Pepi introduces us to the anthropological term code-switching: "changing vocabulary, grammar and symbols from one fandom to another". I'm often not even aware of what codes I'm using, because it comes to me so naturally. This becomes clear when using geek language in the vicinity of non-geeks. "Yeah, good. I did a mushroom excursion. Didn't see that many interesting species, but the heather club fungus was a score." Our friends that are listening in are keeping up; they're all nature nerds, although some of them are more familiar with the sub field of fungi than others. "Oh yeah, and I finally managed to beat the last encounter of chapter 6! It was really hard, but in the end I insta force lifted one add and killed the other asap, so it wouldn't one-shot my companion." This is where my friends zone out. They know she is talking about gaming, but they can't translate what they hear to something meaningful: they don't understand the code. Interesting to note is that my friends don't appreciate us talking about online games, I imagine because they feel excluded. Because we have nice friends they don't tell us to shut up, but you can tell from their body language. (The yawns are kind of a giveaway.) So I try to not talk about our online adventures (that are as real to us as anything we do together) in front of our friends. We learn from Pepi that "geeks tend to communicate using different vocabulary and symbols depending on the fandom they belong into. Said in other words, depending on the speech community they tend to use certain ways of speaking and certain symbols." Oh yeah, and I finally managed to beat the last encounter of chapter 6! It was really hard, but in the end I insta force lifted one add and killed the other asap, so it wouldn't one-shot my companion. Words marked with blue are recognized by all members of MMO culture: they represent mechanics or systems that are commonly used in all massive multiplayer online games. Words marked with red are recognized by players of the MMO Star Wars: the Old Republic (SWTOR), the online game that my friend was talking about. MMO players can make an educated guess about what is talked about, but these words have an extra layer of meaning to SWTOR players. chapter 6 = a SWTOR player will assume this is the chapter from the latest released expansion, Knights of the Eternal Throne (spoiler alert! ), which ends with a fight with emperor Arcann and his knights. insta force lifted = SWTOR players familiar with the sage class know force lift is an ability that lifts an enemy target in the air, rendering them harmless for a duration of 60 seconds. A utility can be used to make this ability activate instantly. companion = non player characters that can be summoned to talk to, fight for you or be sent out to crafting missions. You can have one companion with you at a time. While I'm talking about the speech community of MMO players and a sub speech community within that of SWTOR players, words are not necessarily strictly confined to those communities. For instance, SWTOR is a game by the company Bioware. Almost all Bioware games have companions, so a gamer that isn't familiar with SWTOR, but has played other Bioware games, will still have a gist of what "companion" means. Another, more complex example is "asap": this abbreviation comes from the world outside of gaming. Noteworthy is that it - as anything typed in chat - is usually written in-game without capitals rather than the official capitalized spelling. Edit: I picked this word up in the Lord of the Rings Online raiding scene, where it was regularly used in typed instructions regarding group tactics. LOTRO has relatively many British players due to its Middle-earth setting, which probably explains why it turned up in this speech community specifically o(bservant readers have pointed out that it is in general use in British business contexts). In this instance, gamers took a word from a non-gaming speech community and applied it in a gaming speech community, introducing it to a new, international audience. The world of geek language in online games is huge. Even within SWTOR there are different speech communities of which the members will not understand each other completely, even though everybody is playing the same game! I will explore this in my next article (part 2). 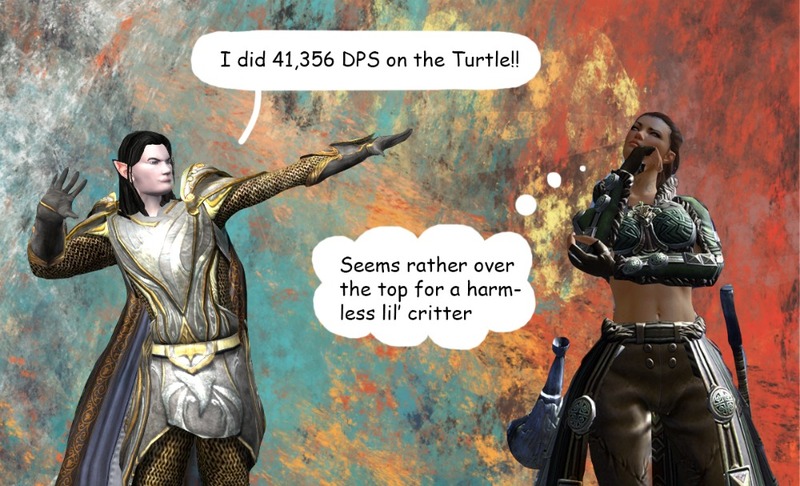 For now: do your friends hate it as well when you talk about MMOs? When do you find yourself code-switching between geek languages? 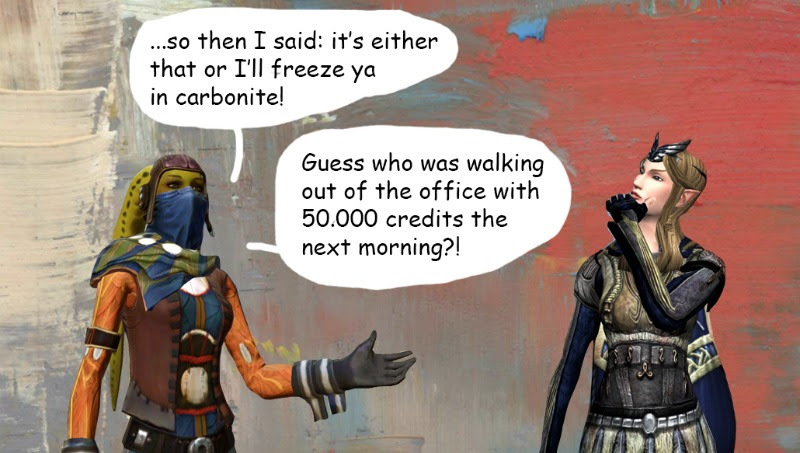 Even across MMOs, the same words may have slightly different nuances. I had an amusing "lost in translation" experience while trying out raiding in Age of Conan. My previous tanking experience was in City of Heroes, There, tanks are expected to run around and grab aggro of as many mobs as they can take, then pull them all back to a corner where the rest of the group stood by ready to nuke and top off the tank's health if needed. Tanks in CoH are very sturdy beasts and are expected to stay in position, anchoring all the mobs in a neat little clump for easy AoEing them down. Tanks in CoH also maintain aggro via attacking, with only one ranged taunt if they chose to take the skill. Cue Age of Conan, where I was assigned an off tank position and a pocket healer to watch me, and told to pull and kite the mob to a side pillar over yonder, while the other offtank and pocket healer did the same on the other side, and the rest of the raid hit the main boss. Seemed simple enough, no? So I faithfully took aggro of the add, and pulled it to the side, and zealously kept hitting it in fear of the healer getting aggro, and tried to not wiggle around so that the bear shaman healer would have an easier time AoE healing me up. Except either my armor sucked or the healer's stats for healing sucked or both (or the itemisation in Age of Conan was also plain horrible during the launch days), I just melted in under 30 seconds without feeling much heals at all. The raid leader kept screaming his head off, going "what's going on" "kite" "kite" "what's wrong" and I was thinking, "I -am- pulling and kiting the mob, I -have- aggro. I'm just not -surviving- the aggro." I even googled up the word "kite" to see if it meant what I thought it meant, ie, "pull." ...both of us continued talking right past each other. Fortunately, the other offtank was really observant. Or at least, knew how to get the point across without words. He told the raid leader, "let's do one trial run, Jeromai, you watch me and do what I'm doing the next time." During the demonstration, I watched the other offtank -barely- hit the mob and still hold aggro, while staying what seemed to me like a metre away from the mob, and run in a merry go around circle around the pillar while his (to me) poor healer chased after him. Inside, I was like, "OHHH. So -that's- your definition of kiting. Um, ok, I can do that, no problem." I'd basically prioritized healer and damager ease over personal survival, while the raid was more concerned with "just don't die, and keep the adds away from us." The very next try, I took my pocket bear shaman and the add on a merry chase around the pillar, and the raid had all the time in the world to take out the main boss. That's a great example! I definitely agree that shared words having slightly different meanings across MMOs (but my post was already getting long as it is, hehe). It's also something I can relate to within my own MMO background (of very different MMOs). For instance, in LOTRO you have to let an enemy hit you every once in a while, or they will reset (it's an anti-exploiter kinda thing). So you would actually have to kite as you were doing initially. 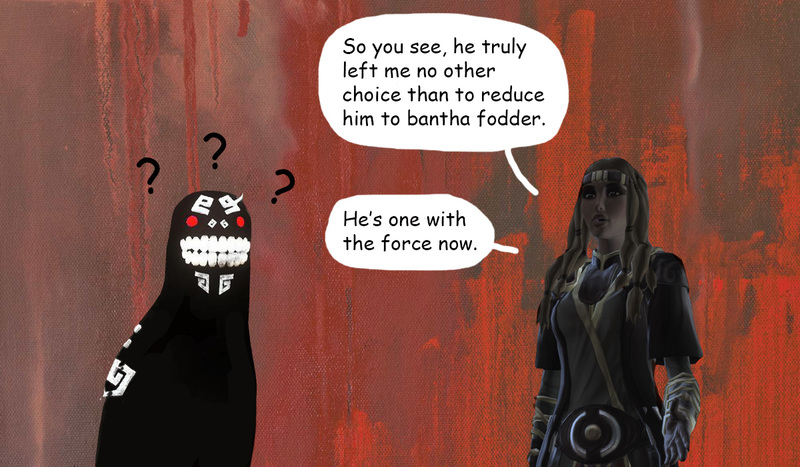 In SWTOR, however, I have tanked a boss in the Age of Conan way. That particular boss has a specific skill that will one-shot the nearest player if they are in melee range. So there I'd have to keep aggro using ranged taunts and being away from him at all times; the rest of the raid being even further away so they wouldn't be the nearest target. Both are examples of kiting, but the particular fashion in which you do it depends on the rules of the combat the game has. As for your raid leader, I guess it's easy to forget that things that are logical to one being very familiar with a game, may not be that logical to someone who is new to that game and has yet to discover those subtle particularities of the combat system. That's something you get a feeling for when playing an MMO intensively for a certain period of time; and even then you may not be aware of it until something goes wrong. I'm happy your story ended with a positive learning experience rather than drama and shouting, as such misunderstandings tend to cause. I'd quibble with ASAP being MMO jargon. I associate it mostly with business jargon, where I've seen it used routinely for decades. I've rarely seen it used in any MMO I've played and never with a particular emphasis that would put it in a bracket with "kite" or "aggro" or "port" or other technical terms. Maybe it gets used more in SF settings than in fantasy? I'm with Bhagpuss on "asap" being business jargon, not MMO lingo. If I had to think of an example sentence featuring the expression, it would be something like: "Make sure to finish that report asap." That aside, I don't run into these particular language problems very much since I tend to be quiet about my hobbies around people who I know are not interested in gaming. I do often have fun with the minor differences you describe though, such as when I explain to a WoW player that "warzones are SWTOR's battlegrounds" and stuff like that. Thanks for the feedback; it's nice to know where that word stems from. I had never heard from "asap" before I started raiding in Lord of the Rings Online, where it was used in guides for boss fights and in written tactics in the in-game chat box. I had to ask people what it meant and if it was important, because I had no clue! I think it's rather the populace of that specific MMO than SF vs fantasy: there are a *lot* of British people playing LOTRO. I suspect that has something to do with the lore; Tolkien being British and creating the Shire as a sort of romanticized rustic Britain. Pretty much like Dr Who is more popular in the UK than anywhere else in the world. There is also a temporary dimension. We're talking ~8 years ago now, when I wasn't using voice chat yet and hence relied more on written chat. I haven't read the word in more recent years, which can either mean it's used less or it's just because I don't pug in LOTRO anymore and generally use voice chat rather than typing. Either way, vocabulary is always in motion. As for Shintar's second paragraph: I am always so confused by chat when I try out a new MMO! Even though you'd think that after trying out all these different ones it'd be easier, it all sounds like some secret language until I find out what all the names and acronyms mean. I generally just turn it off for the first couple of months while I explore my surroundings. I don't think ASAP is British. We have picked it up from Americans, specifically the US Military. You hear it in Hollywood action movies all the time. Interestingly, when I first heard it here in Blighty, people pronounced the letters A.S.A.P. In American media they always seem to pronounce it as a word instead - Asap. I always thought it was an American army term, too. Funny how words travel around and gain new meanings in different contexts. Cheers for the input. American Army veteran, here. I've seen ASAP (written many ways) since the early 1980s when I was a teenager, and we've pronounced it both spelled out and as a word. Though I think it's more common to say it as a word now. Fortunately all the ones I care to call friends also play games so I never had much trouble talking about it. My family though is the complete opposite. Almost none of them play games. So in family gatherings I tend to be the mute one. Not only because of that but because my other interests (books, comics, manga, anime and some TV series) are not something they share either. The exception is my older brother who like me grew up playing games and still does it. Although he plays more on consoles nowadays than on PC so some times there can be some gap of knowledge that even we don't realize at the time. Also, we tend to just talk about it when it is just the two of us. Oh, yeah. Difference in the types of games is also something that happens with my brother. He always preferred shooters, sports and fighting games. While I always preferred RPGs and turn-based strategy games. I think the only genre our tastes overlapped was in adventure games but I am not sure about that. He tried to get into MMOs too, back when World of Warcraft was relatively new, even got the Burning Crusade expansion. But that never lasted too much. Even myself I can be quite picky about the MMOs I play but I definitely took more of a liking to it than him. Those are some great examples of same thing, different name between MMOs! I'm not sure whether it's a curse or a gift either. For now I'll stick to 'interesting phenomenon'. WOW! I love this post!!!! This is gold! This post helps me get you better :) I love that you took your time and decided to let others know more about gaming vocabulary. (I would have been zone out pretty quickly). Please, keep writing posts like this!!!! Thank you, Pepi! There were so many useful terms in your post that applied to (MMO) gaming so well! And I feel honoured that it actually made you get me better (even though I do try to keep my gaming terminology to a minimum). Sometimes I feel like I'm part of some 'secret gaming club' when I'm talking about MMOs in the offline world. I don't like that, because I don't want to exclude anyone! But at least it's an interesting subject capable of inspiring many more posts to come. Interesting and well put together post! Something I don't really think on too often, but you're totally right. My hubby had to teach me wrestling geek lingo, for example, just so I could somewhat follow along when he goes on his tangents. :p Then there are times I'll be talking to my dad, who isn't that nerdy at all, but on occasion something might come up that does have its own sort of lingo, and I have to reign myself in, just a tad. It's interesting how we are able to do that. It sounds similar to how people are able to act differently around different people. The social chameleon thing. Those are great examples of using different speech depending on the fandom! I would have no clue about wrestling geek lingo, either. When I think of instances in which I have to try and code switch to other people's fandom speech, it'd have to be Conrad. He enjoys reading Reddit a lot and knows all the memes. He finds them hilarious (me, sometimes, but often I think they're a bit lame) and makes it his mission to explain them to me every now and then. So now I know what e.g. business cat is (probably my favourite one); not that it has much of a use other than being able to share and talk about funny things we find on the internet. Great post. I can so relate to many of your examples and those in the comments. As you know, Rav, I play SWTOR and LOTRO mainly and they have different lingo. I've also played quite a few other games so there are moments I switch to the wrong 'language'. One of those games was Age of Conan so I laughed at the 'kite' tale. Reminded me of some fervent 'dungeon instance' group leaders in Perfect World screaming at the poor Venomancer - fox women who were only class who could tame pets - to correctly pull the mobs one by one with her pet. Yes, each MMO has their own language, even though a lot of gameplay systems follow the same concept - so confusing at times! It really takes me a while to understand what everything means, and only then I feel truly 'at home' in an MMO. The Venomancer sounds like a class I could've enjoyed. Not many games in which pets are used to pull stuff in group instances. Pulling was a skill worth learning on a veno. Mine ended up quite good at it - rather crucial as a guild leader - but my favourite veno skill was taming new pets, and I collected dozens of them. Favourite was a mechanised crab that stopped ever so often and wound himself up. Quite an interesting post. For sure, my friends don't get me when I talk about MMOs. Of course I don't get my guildies sometimes when they use some jargon from an MMO I've never played. That makes a lot of sense! I guess I'm blessed almost everyone in my (cross MMO) guild plays the same palette of MMOs, so that doesn't happen to me very often. I have some gamer friends so we talk about the games we play and the MMO we play. I have one friend that doesn't like playing games but she loves hearing people talk about playing games. Then there's my other friends that probably don't even realize that I am a gamer. Very interesting how I separate things out with out even thinking. When my husband and I played DDO there was a term called piking. It meant that the player let them self be carried through a quest or raid. So being called a piker was not generally a good thing. I haven't heard this term in any other MMO I've played. GW2 I learned that zerg didn't necessarily mean to run past mobs in a quest to get to your objective. It means a large group of players working for the same goal. If you want to run past mobs in a dungeon it's called skipping. And I never learned what an add meant until I played LOTRO... DDO didn’t use a term for the extras. It was just kill the mobs! That's definitely interesting. Also, kudos to your friend that doesn't play games but loves hearing people talk about them - that's a keeper! I've never heard of 'piker'. It must be one of those rare words that are truly unique for a specific MMO and that don't relate to a game or gameplay system. I would argue that "to carry through" in itself has a special meaning in MMOs (even though it also means something in the world outside of it), since it's always used in the same specific context. I always imagine a big group of people running into another faction in World vs World with great speed, murdering everything around them. It kind of sounds ferocious. The term "zerging" comes from the game Starcraft. It is a Real Time Strategy game in a science-fiction setting where there are three factions: The humans, who were relatively balanced in everything, the alien Zergs whose units were relatively weak but cheap to build and the alien Protoss, whose units were relatively powerful but expensive to build. During the single player campaign you played with the three factions at different parts of the story. So you got to learn what made each one tick and had to change your strategies to keep up with each of their strengths and weakenesses. Since the zergs were weak but cheap, the easiest strategy with them was to build a ton of them and just overhelm the enemy with sheer numbers. I played the original Starcraft a long time ago and the Zergs were my favorite faction in the game. So when I saw the term "zerging" being used outside of that game I found it really amusing. Hahaha, thanks, Rakuno, for increasing the nerd level of this blog by 100%! Seriously, though, I had no clue, so it's nice to get some background information. I never played Starcraft, either, so in this case I'm particularly clueless. This kind of thing is hard to find out about unless you know someone who 'was there'. Another thing I've heard people mention often in GW2 is "zerg build". I always imagine it's the same as is referred with a 'glass canon' setup in other MMOs, which seems to correspond with your Starcraft story. Any thoughts on that? If you like RTS games and are interested in Starcraft, I think you can still buy it from the Blizzard store. Keep in mind the graphics are from like 20 years or so ago, in case that bothers you. Otherwise there is the much more recent Starcraft 2. I haven't played that one though so I can't say how good or not it is. Never heard of "zerg build" myself either. This is the first time I hear the term. I tried googling it but didn't find a definition, only discussions about character builds. Since it is been too long since I played the game I couldn't infer what the builds were supposed to be good at. All I could infer is that it was for World vs. World.